Matthias Lilienthal had a difficult start as Artistic Director of the Kammerspiele. His appointment was met with open hostility and several actors soon left his ensemble because they supposedly did not like Lilienthal’s kind of theatre. I was following the controversy in the press whilst I was still living in London. Last year, however, two Kammerspiele productions received invitations to the Berliner Theatertreffen. This year, Susanne Kennedy’s The Virgin Suicides and Christoph Marthaler’s Tiefer Schweb were invited to the Wiener Festwochen. 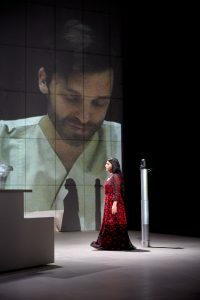 Only recently, actor Wiebke Puls was awarded the 3sat gong (3sat is a German TV station) for her performance in the Kammerspiele production Trommeln in der Nacht. By inviting directors Philippe Quesne, Toshiki Okada, and Amir Reza Koohestani to the Kammerspiele, Matthias Lilienthal has made the theatre truly international. But obviously that still was not good enough for the conservative party CSU who voted against extending Lilienthal’s contract (a decision that has to be made by the city council). Therefore, Matthias Lilienthal will leave Munich in summer 2020.